Political unrest in Nicaragua has caused many charities and other Non Governmental Organizations (NGOs) to stop hosting service trips to the country. Revenue from these trips is the main source of funding for many small-scale development projects in Nicaragua so the cancellation of trips puts many projects in difficult financial position. This means that badly needed schools and library facilities are left unfinished leaving kids in crowded, often leaky classrooms. Not only do these projects provide badly needed infrastructure they bring communities together in a constructive and meaningful way - at a time when communities are suffering tension and hardship from the ongoing unrest. Our NGO partner, Seeds of Learning (SOL), has been leading service groups to work alongside local communities building schools, libraries, and learning resource centres in Nicaragua for over seventeen years. They also organize and deliver vocational training in welding and agriculture to men and women. Despite the unrest and travel restrictions SOL remain committed to supporting the communities to complete the projects they have already started and to continue to offer "A Hand up, not a hand out". In April when the unrest made travel risky, we canceled a trip planned to the village of Mesa de Acicaya in the Tipitapa region of Nicaragua. In our absence SOL continued the project with local volunteers and welders who were trained in one of the courses we previously funded with donations like yours. You can see the progress in the attached photos and hear about the project in a short video. Due to continued tensions and unrest we have temporarily diverted future Winds of Change service trips away from Nicaragua but will continue to provide funding for materials and local skilled labour to complete the projects we committed to support. Los Laureles is a semi-urban town of around 3,000 people located in the municipality of Tipitapa, Nicaragua. It is home to a large public school which serves 475 students from pre-kindergarten through high school. The school also serves as the administrative and technical headquarters for five other schools from five nearby communities, and the principal overseeing all these schools is based in Los Laureles. The school at Los Laureles is large and has sufficient classrooms. However, there is not adequate space for the school’s library. The existing stock of books and educational materials are piled in a small room that was originally intended to be the principal’s office. The room lacks space for chairs, tables, and bookcases. The Nicaraguan Ministry of Education has already hired a librarian, but she will not begin working at the school until a proper library space is available. In 2018, Seeds of Learning partnered with the Los Laureles community and international volunteers to build a new two-room library. The building is located on the school grounds, and will house bookcases stocked with a variety of reading materials, tables and chairs for students, a multimedia projector and screen, a sound system, and ten Chromebooks. The library will also be used for other educational activities and classes, such as arts and crafts, dance, and vocational trainings. Community members of all ages will also have access to the library, as well as teachers and students from other schools. We believe the library will help create conditions for high quality learning at the Los Laureles school. Construction of this new school library is underway, in partnership with the local community and One Dollar for Life, Winds of Change, and the Rotary Club of Sonoma Valley. Our construction timeline has been extended due to the unrest in Nicaragua, and we anticipate finishing this project before the end of this year. MESAS DE ACICAYA - TWO CLASSROOM CONSTRUCTION: $7560 needed to complete the work. Note: this is the project Winds of Change was scheduled to help with in April when the unrest broke out. We were within a few hours of departing when the local situation turned dangerous. Mesas de Acicaya is a remote, rural community located in the municipality of Tipitapa, Nicaragua. Most of the 856 inhabitants are small farmers who grow beans, corn and sorghum. Historically the community has received little support from public and private agencies, which makes development a challenge. The local leadership has organized most of the local projects, using resources raised within the community. In 2017, Seeds of Learning partnered with the Mesas de Acicaya community to build a Learning Resource Center (LRC). The LRC was requested by a group of high school students who belong to a local organization named Caminos al Saber (Pathways to Knowledge). This group of youth is dedicated to promoting access to quality education in the community. In addition to spearheading the LRC project, the youth are committed to running the LRC in the long-term as well as organizing additional educational projects. Click here to read more about the LRC project. 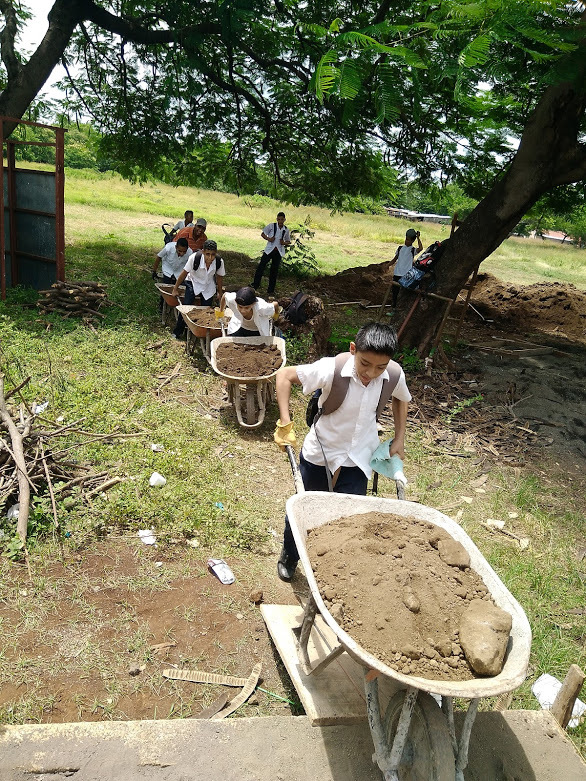 In 2018, the students of Caminos al Saber and local teachers have requested support in expanding the local school by building two new classrooms. We look forward to working with the local community on this project, as well as partnering with Winds of Change, who is providing funding. The school currently has just three classrooms for five different grade levels, which means that some students attend classes during a morning shift while others have to wait until an afternoon shift. There are also high school classes which operate out of the school on Saturdays, but there is not enough room for all the students. One grade level is forced to hold their classes in the local community center, which has a damaged roof. The two new classrooms will not only alleviate overcrowding and ensure there is enough space for the current students, but will also provide sufficient space for both elementary and high school classes to expand. Construction of the two new classrooms began in April. The project has been delayed due to the political unrest in Nicaragua, but will resume in the next few months. We look forward to continuing to work with local community volunteers and partner organization Winds of Change to complete this project. Together, these projects need $11,810 CDN to be completed. Whatever you can do to help is GREATLY APPRECIATED!